This walkthrough uses the DNSBL portion of pfBlockerNG to remove ads/advertising and more importantly, malvertising. It essentially creates a functionality similar to the pi-Hole project except it doesn’t require a separate piece of hardware. Instead, you just use your pfSense (pfBlockerNG)! If you’re interested in a write-up on installing/configuring the pi-hole on Ubuntu, I have one here. I love pfSense and if I could only install one package to enhance its capabilities, it would undoubtedly be pfBlockerNG. pfBlockerNG is a pfSense package maintained by @BBcan177 (on Twitter). It’s worth mentioning that BBCan177 has a Patreon campaign where you can easily donate a few bucks to ensure he continues maintaining and adding to the package. pfBlockerNG adds all kinds of security enhancements that I’ve discussed previously such as blocking known bad IP addresses with blocklists (link below). If you don’t already have the blocklist functionality in place on your pfSense, I would strongly recommend adding it after you’re done with this walk-through. Next, go to the DNSBL tab and it will take you to the default DNSBL landing page. Place a checkmark in ‘Enable DNSBL.’ If you only have one internal interface (such as LAN), then you shouldn’t need to do anything else. If you have multiple internal interfaces and you would like to protect them with DNSBL, then you will need to pay attention to the ‘DNSBL Firewall Rule’ section below. First, place a checkmark in the ‘DNSBL Firewall Rule’ box (red square below). Then, select the various interfaces (to the right) by holding down the ‘Ctrl’ key and left-clicking. Don’t forget to hit ‘Save’ at the bottom. If your pfSense has plenty of memory, another really amazing feature to consider is TLD (below the DNSBL option in the picture below). This option is required for the TLD blacklists discussed later in the walkthrough. What does the TLD feature provide? Normally, DNSBL (and other DNS blackhole software) block the domains specified in the feeds and that’s that. What TLD does differently is it will block the domain specified in addition to all of a domain’s subdomains. As a result, a bad guy can’t circumvent the blacklist by creating a random subdomain name such as abcd1234.linuxincluded.com (if linuxincluded.com was in a DNSBL feed). That’s really powerful and as far as I know, it is one of the few DNS blackholing software that does it. If you’re unsure on your memory, this might be a feature to come back to after you get your feeds and everything else configured. Nonetheless, don’t sleep on this extremely powerful feature because TLD can definitely add several layers of protection. 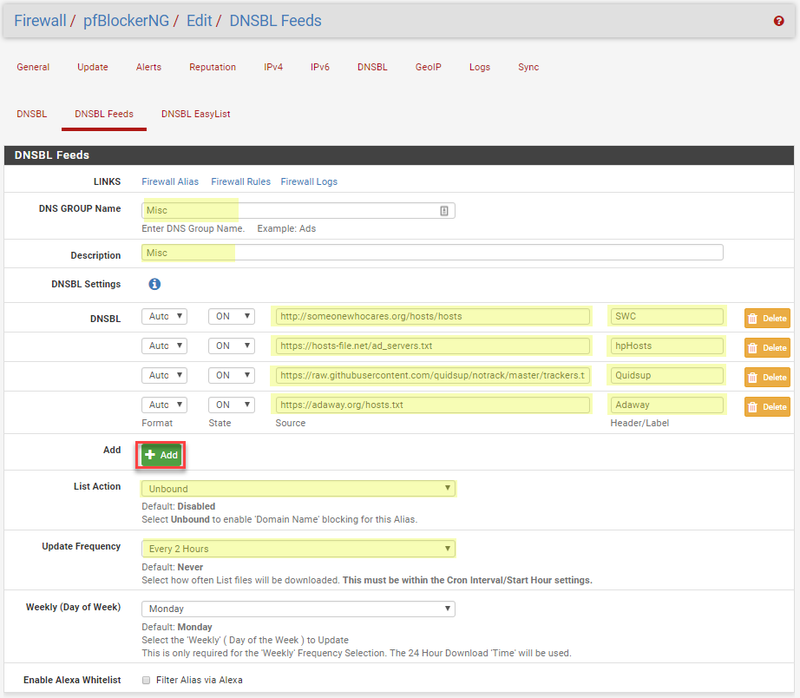 Now, head over to the ‘DNSBL Feeds’ tab and click ‘Add.’ Once there, make DNSBL feed page resemble the one below. Below the image, I’ve provided the text below so you can easily copy/paste it into the page. To add more lines, click the ‘Add’ in the red box below. Once again, don’t forget to hit ‘Save’ at the bottom. Assuming everything went as planned, when you clicked ‘Save’ you are taken back to the DNSBL feed list and it will look like the one below. These are some other DNSBL feeds that I found to be very useful. To add them, you can either ‘edit’ the previously created DNSBL feed above by clicking the pencil next to the ‘Misc’ line item or simply add another. If you add a separate one, make sure you follow the settings above, although you can call the “DNS Group Name” malicious, largefeeds, pihole, or whatever else you like. The feeds below are large, but they are very good feeds. If you using a system with limited resources (mainly RAM), then these might not be for you. When in doubt, add the feeds slowly and keep an eye on memory, CPU, etc. Sites silently autofilling and extracting email addresses and other information for tracking. It’s based on the work from the Princeton folks found here. A list meant to prevent browser mining. These lists (in conjunction with two above) are what is used by default with the pi-hole project if you are trying to mimic it. Next, go to the DNSBL Easylist tab. These are additional feeds that are simply a little easier to add. Make your screen look like the one below and then click ‘Save’ at the bottom. Note: To select all of the EASYLIST categories you need to hold down the “Ctrl” key while you left-click on each of them. It’s also worth mentioning they are privacy related selections in the EASYLIST. I found these to be mostly unusable because they broke several things (mainly related to Amazon), but your mileage may vary. Now, go over to the Update tab within pfBlockerNG. Heed the warning in the first red box and make sure you are not going to run the updates near the time your cron job would automatically run. If the countdown timer is less than 3 minutes, I would not recommend running it and instead just wait for the system to run it automatically. Assuming you are good on the time, go ahead and click the ‘Run’ button. 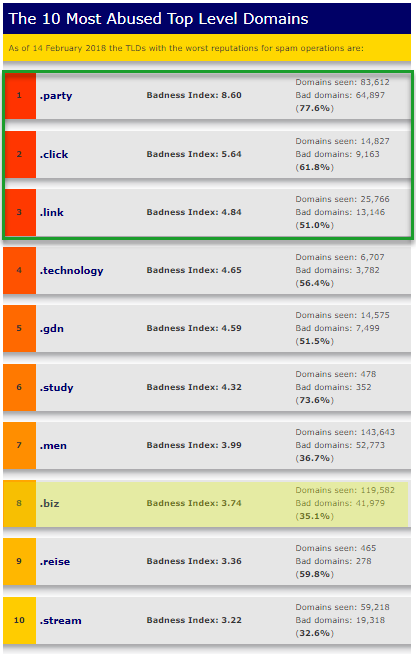 You will see progress updates in the gray window below including the number of domains downloaded by each list. Also note that pfBlockerNG is smart enough to check for and eliminate duplicate DNS (# Dups) entries between the lists. [ SWC ] Downloading update .. 200 OK.
[ hpHosts ] Downloading update [ 01/04/18 15:58:40 ] .. 200 OK.
[ Adaway ] Downloading update [ 01/04/18 15:58:45 ] .. 200 OK. So what does the finished product look like? On YouTube, you’ll see that gray boxes like the one shown below where an ad normally would have been. A browser add-on like uBlock Origin (discussed below) further cleans this up by removing the gray box entirely and it also provides some secondary protections. If you visit Yahoo.com (why? 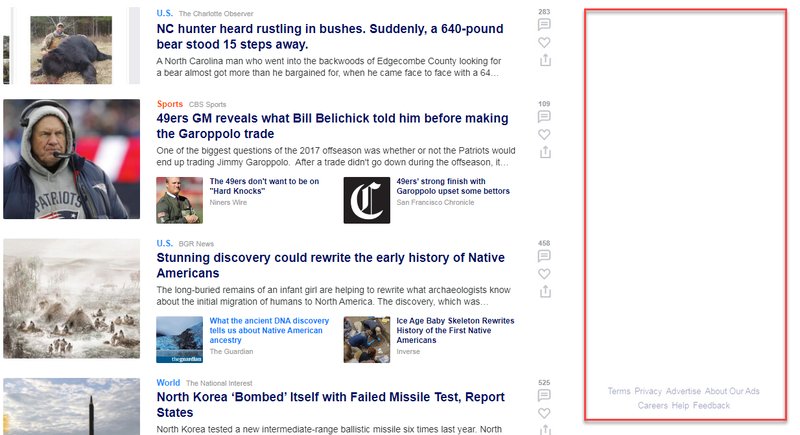 seriously, find a new news site), our pfBlockerNG configuration eliminates the wasteland of ads that you normally see as well (red box below). So you see the end result when browsing, but what’s really going on? How the DNSBL portion of pfBlockerNG works is most easily seen via a command line. Normally, you would ping 302br.net and get back their actual IP address. However, with pfBlockerNG properly setup you will instead see a reply of 10.10.10.1, which is the default virtual IP address DNSBL creates. Basically, the ad/malvertising domain name is blackholed instead of displaying (or resolving). Feel free to test this against any domain in any one of the lists that you added. If you followed all of my examples above for both ads and malicious sites, you will likely have a DNSBL list that is well into the hundreds of thousands if not millions. PING 302br.net (10.10.10.1) 56(84) bytes of data. PING analytics.yahoo.com (10.10.10.1) 56(84) bytes of data. What happens if/when a website is inadvertantly blocked? Afterall, it is bound to happen. You can either remove the offending list entirely or more preferably, you can just whitelist the domain. The absolute easiest way to do this is by going back to the main DNSBL tab and clicking the ‘+’ to reveal a textbox for input. Simply type each domain in on a separate line and then click ‘Save’ when you are done. If you want the changes to occur sooner rather than later, go back to the ‘Update’ tab and click ‘Run.’ If you don’t want to do the trial and error on your own, I have provided some whitelist recommendations below. It’s also worth mentioning that if a system already resolved the domain name and it is now resolving to 10.10.10.1, then you may need to clear your local DNS cache, your browser cache, or both. To clear your machine cache, from a command line on Windows, type in ‘ipconfig /flushdns’ and that should take care of it. You can do the same on a Linux system, although the commands can vary from one installation to the next. More often than not, simply restarting your network interface will work. Thus, on most distributions, ‘service networking restart’ or ‘systemctl restart network’ should take care of it for you. Each browser has a slightly different way to clear the cache, however, all of them allow you to pull a new version of the website if you hold down “Shift” while clicking on the refresh/reload button. If ads are not getting blocked and the ping commands above don’t return the virtual IP address, it’s also possible your local machine is not using pfSense for its DNS settings. If you are using Windows, check your network settings and make sure it is set to your pfSense IP address. On Linux/*nix, check your /etc/resolv.conf or even Network Manager (if using a GUI). If you are not using pfSense for your DHCP server, you may need to do some digging. Although somewhat uncommon, keep in mind that some anti-virus packages can mess with DNS configuration settings too. These are a few domains I’ve seen cause issues if they end up on the various DNSBLs. You can easily copy and paste them into the “custom list” as described above. If you have no plans to use some of them (based off their name alone), feel free to omit them from your list. Do you have other recommendations beyond the ones I have listed? Let me know and I’ll add them! TLD (top-level domain) blacklisting is another option in DNSBL. Don’t forget you need to ‘Enable’ the TLD option at the top of the DNSBL configuration page to use the features discussed here. While I don’t normally advocate static blacklisting because the bad guys will simply move around it, TLD blacklisting is a rare instance where you can eliminate some potential attack vectors although its usefulness depends entirely on your situation. TLDs are the characters after the last dot on a domain name, e.g. com, net, and biz are some common ones. The number of TLDs has skyrocketed and there were well over 1,500 in early 2017! Over time, some TLDs have become wastelands for nefarious activity such as command and control servers. If you no plans to connect with a particular TLD and it has shown to be less than reputable, i.e. most sane companies wouldn’t bother trying to use it, you can just go to the main DNSBL tab and block it outright using the section below. Even Brian Krebs got in on talking about the how some TLDs are used extensively for typosquatting — Omitting the “o” in .com Could Be Costly. If you don’t want to read the full article, just understand that instead of typing in remax[dot]com, a user mistakenly types in remax[dot]cm and is directed to a malicious site. There are similar alternative .cm domains for ESPN, Hulu, iTunes, Aetna, AOL, Chase, Facebook, WalMart, etc. and over 1000 others. Needless to say, the .cm TLD is not good. If you’re looking for a little more guidance of what is ‘bad’ then look no further than Spamhaus and the website link below. 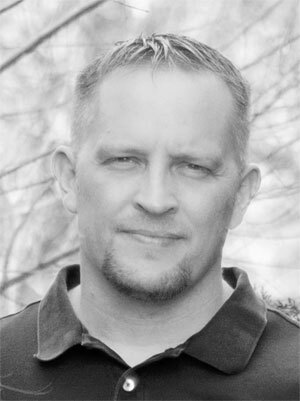 Our friend Brian Krebs wrote a great article about the badness of TLDs as well. Spamhaus is constantly updating this list and related statistics so check it directly for the most up-to-date information. At the link below, you’ll also find a dropdown to show you the ‘badness’ of every TLD even beyond the top 10 list. At the very least, I would suggest adding the top 3 TLDs in the green box below along with the .cm TLD from the Krebs article. Adding the entire top 10 would likely not cause too many issues, although keep in mind that you will see false positives. For example, note that #8 in the list below is .biz, which is used by legitimate businesses. I’ve added a textual version of the TLD list below the image so you can easily copy/paste it into your firewall. DNS blacklists are great, but what if a new ransomware botnet pops up, a user gets infected fairly early in the campaign, and it starts calling previously unknown domains? If your DNSBL feeds are set to update every 4 hours and it takes time for them to get included on that list to begin with, it might take awhile before your DNS catches and blocks it. We need something more real-time… To provide another layer of protection, I would also recommend using Quad9 as your primary DNS on pfSense. I wrote up an article some time ago about how to do just that. I constantly preach defense-in-depth and this is no different. 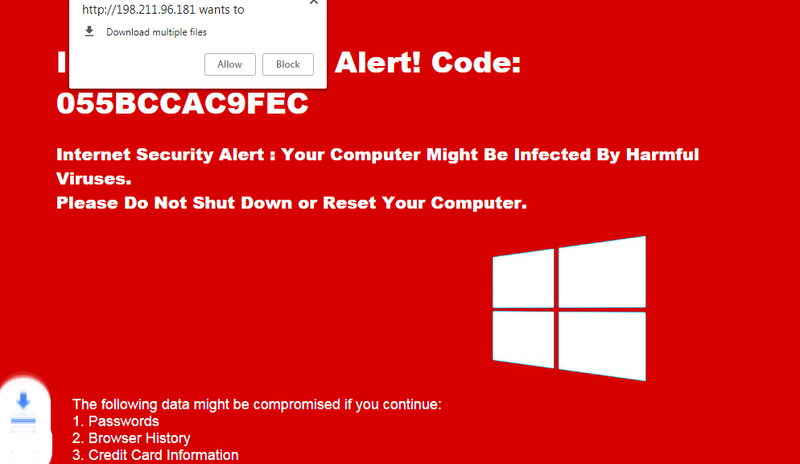 You could have every malicious advertising domain on the planet included in your configuration, but a new one will inevitably pop-up 5 minutes from now. Aside from some other defenses, I would also strongly suggest using uBlock Origin on all of your browsers. uBlock Origin exists for Chrome, Firefox, etc. so there really isn’t a reason not to have it! While nothing is foolproof, it is another fantastic addition to your overall security. Nice guide. THe other thing I do for monitoring is clear the dnsbl.log file. Run an update, then download the log file. Pull the summary information and you can see what filters are doing the heavy lifting. The filters will change position between successive runs because another filter may capture a domain first on one run and be blocked on another. You can see which filters are not adding additional value. Glad you enjoy it and good tip! This is slightly easier in the upcoming release too because it provides stats on what is getting blocked too. I’ll write up a new guide once it is released. Not a problem! Glad to hear it helped! Enabling this blocks all amazon(with alexa enabled) and all apple sites. Only using EasyList. Also, I dont want to make it sound like your guide isn’t complete or lacking. You have a pretty good guide here! I just don’t understand why these other services always break when this service is enabled. Robert, thanks for the feedback. As I noted above, issues with Amazon is the main reason I avoid using the privacy lists. I just tested the setup and I was able to get Alexa to access Pandora with all of the lists mentioned above running (related DNS traffic below). If you’re seeing something different, please let me know so I can get it changed for other readers. Thanks! I had a question about the DNSBL Firewall Rule section, In my setup I have multiple Interfaces on my LAN side. I basically separate user computer from VMs that run services. I’m a bit confused on this area. Am I supposed to select the interfaces I want to protect and then check the box? The Image highlights that check box, but shows it unchecked. Am I supposed to select interfaces only or select interfaces AND check that box? Sorry if this is a super basic question. Not a basic question at all and I applaud you for segmenting your internal network! 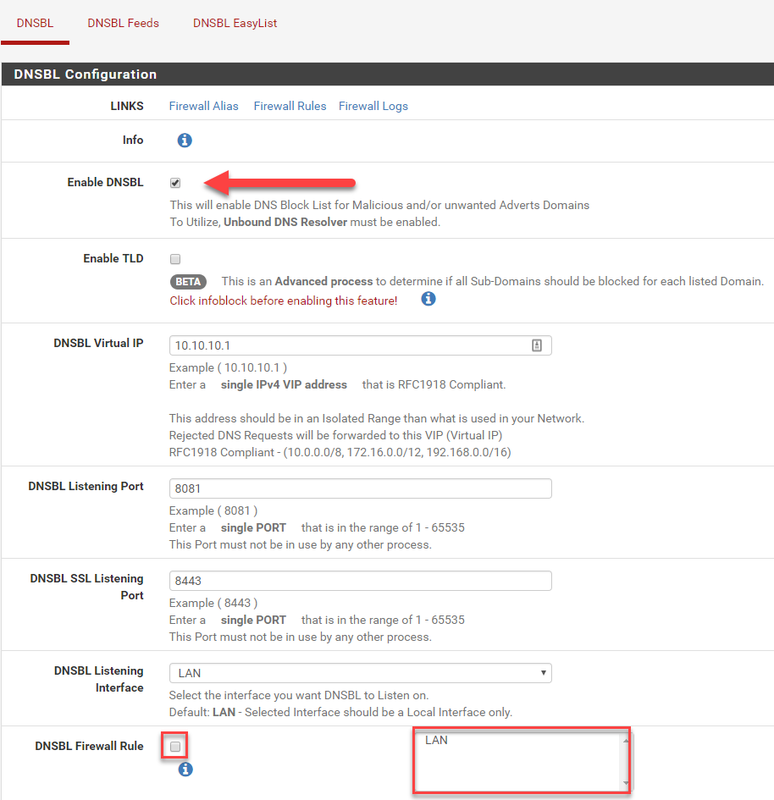 Under the primary DNSBL tab, you will see options for “DNSBL Listening Interface” and “DNSBL Firewall Rule.” These are the options you need to focus on. Assuming your primary interface is LAN, you can leave the DSNBL listening interface dropdown alone. Now, put a checkbox in the DNSBL firewall rule option, select your internal interfaces (using ctrl + left clicking) and then hit ‘save’ at the bottom. Let me know if you need anything else! Thanks for the walkthrough! I was able to implement this easily because of it. Thanks for taking the time to write this. It’s just the kind of hand-holding a rank amateur like me needed. I was going through the pfsense documentation and was getting kind of overwhelmed. So happy it helped you out! Thanks for letting me know! As far as tutorials go, this has to be one of the best! Thanks! Thank you so much for the feedback! Much appreciated! Steve, thanks for stopping by! The guide on blocklists (DNSBL IP) is here: https://www.linuxincluded.com/using-pfblockerng-on-pfsense/ The list action I would recommend is deny both. This will block and generate an alert whether the offending IP is coming in (WAN) or going out (LAN). Keep an eye out for outbound alerts as that means an internal machine is trying to communicate with a known bad IP. Maybe it is a false positive or maybe it is something more… Nonetheless, it’s worth investigating and a great start to threat hunting. Happy to hear it helped! Thank you for the feedback Steve! -Header field cannot contain special or international characters. Hey Reynan! I haven’t seen that error. Can you verify you are not using any special characters in the header/label field? If I remember correctly, I’ve used underscores in the past without issue, although I opted to use camel case (alphanumeric only) in the guide specifically to avoid all special characters. Update: I noticed the one exception to the statement above was my usage of an underscore in the “Coinlist_browser” header/label. I changed this to “CoinlistBrowser” in the guide because consistency is good. FWIW, I was able to reproduce the error you mentioned above by trying to use any other special character (beyond an underscore “_”) in the header/label field. I received the same error when I copied/pasted “BBCDGAAgr” into the Header/Label field. After deleting and retyping the same text everything worked ok. I searched for special characters on all of the field names including BBCDGAAgr and I couldn’t find anything. I’m suspecting an “extra” trailing space is the issue when copying/pasting the names since the field in question has no other special characters. Nonetheless, happy to hear everything is working for you now! Great, easy to follow article. Many thanks. Dear Dallas, great guide well written. I have implemented PIA VPN (https://www.privateinternetaccess.com/forum/discussion/29231/tutorial-setup-pia-on-pfsense-2-4-2 except In step 19, assigning PIA’s DNS servers to None instead WAN). This was working fine, no DNS leak. After setting up adblocking as you described, my dns is leaking. Is there a workaround? Jerome, great question! I don’t use the setup you describe, however, I have looked at it before. I’m assuming you are referring to leaking as external WAN DNS traffic not over the VPN? Without seeing the exact setup, here are a couple of items to check out. First, have you verified the “DNS Server Override” is not checked in the general setup? Second, when you connect via your OpenVPN client, PIA sets the DNS on your TAP adapter (like below). To have the firewall perform in a similar fashion over PIA, you will likely need another outbound NAT, e.g. one for the virtual IP to LAN. Another alternative to avoid DNS data leakage would be to configure DNS over TLS. It doesn’t appear PIA supports DNS over TLS, however, services such as Quad9 and CloudFlare both support it. I’ve written about configuring the latter on pfSense if you are interested — https://www.linuxincluded.com/configuring-quad9-on-pfsense/ . If I ever get around to testing this out myself, I’ll let you know as well. 1) Thnx for the hints. DNS over TLS is of course the preferred option, but I finally solved the DNS leak with the PIA VPN basic settings by changing Services/DNS resolver/General settings/Outgoing Network Interfaces to LAN only (instead of WAN). 2) uBlock, your comments on uBlock inspired me. I simply included this https://raw.githubusercontent.com/IDKwhattoputhere/uBlock-Filters-Plus/master/uBlock-Filters-Plus.txt as an extra DNSBL feed. The result was amazing. I got rid of another bunch of add’s. Jerome, thanks for the heads up! 1) It’s interesting your WAN vs. LAN worked. Do you have a firewall rule that allows DNS on the WAN side? 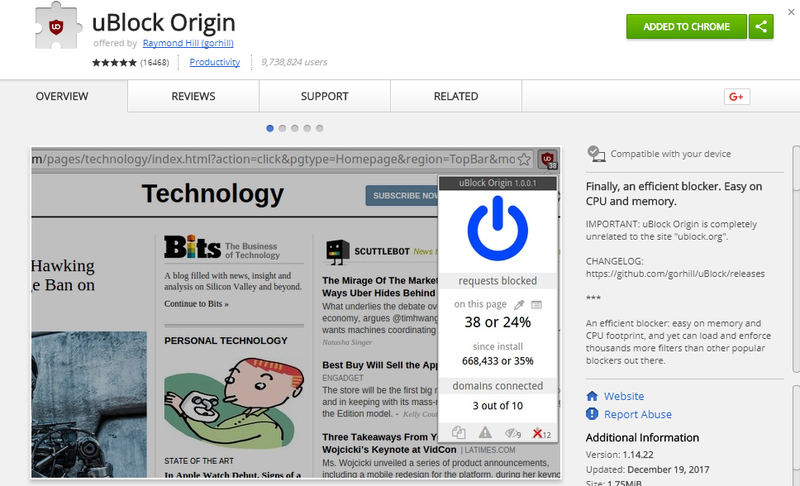 2) That uBlock Origin add-on looks interesting. I tend to let it operate in its default state and leave a majority of blocking to pfSense/pfBlockerNG. Letting pfBlockerNG do its thing is easier with the next version as it makes adding blocklists trivial. On my test system, I literally have 60+ DNSBLs. I received notification from the author that it was sent to pfSense development so it probably isn’t too far off from final release. That website looks like a decent way to test ad blocking. I usually visit the news wasteland aka Yahoo as well as a few others. FWIW, a malvertising ad on Yahoo actually serves as the featured image for this post. The backstory to it is that when I was writing up this how-to, I spun up a brand new VM, visited Yahoo (and only Yahoo) with a up-to-date Chrome browser and no ad blockers (uBlock Origin or pfBlockerNG)… About 30 seconds after landing on Yahoo, I received that pop-up. We forgot how difficult/impossible the web is to use for the average user who has no ad blocking. Thanks for these tips! 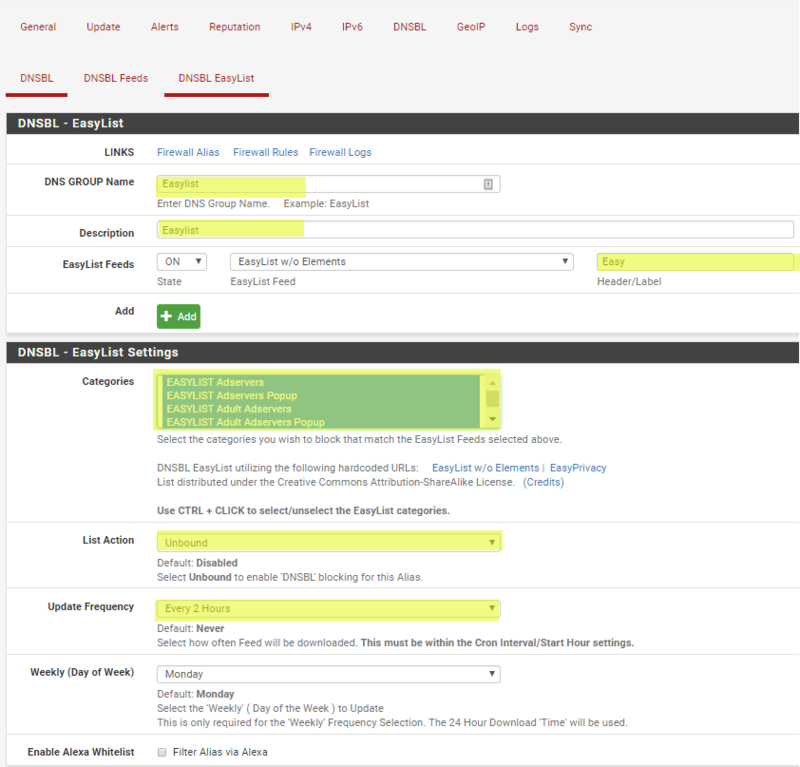 I just setup pfSense, and I feel these tips enhance my configuration. Thanks for the feedback! Easy and great ways to improve security! Great guide Dallas! I was looking for a good guide when I found this. Was able to set it up and get in running in less than 15 minutes. Thanks for that. Excellent guide dallas, thanks for that. I too had a problem with dns leak using expressvpn. Thanks jerome for the fix with changing it to lan. Worked for me too. Excellent! I haven’t got around to testing Jerome’s solution, but I’m happy to hear it worked for you too. I’ll add something into the next version of this documentation when the new version of pfBlockerNG moves from devel to stable. Thanks for the feedback! SUPERB! as others have already explained, your write-up is by far the best i’ve come across, specific to pfblockerng! thank you! DNSBL whitelist is to whitelist any domain that you want to ensure doesn’t inadvertently get blocked by a feed. This can get a little confusing as each feed has its own whitelists; if you manually run an update you will see these whitelisted domains specified as each feed downloads. Also, if a site gets blocked and you whitelist it from the Alerts page (on the new version), the DNSBL whitelist is the area it will get added to. Basically, it is the whitelist that supercedes all blacklists. S3 could not get blocked in the TLD section without significant side effects. Why? TLD refers to the last part of a domain name. For example, on linuxincluded.com the “com” would be the TLD and nothing else. As noted in the write-up, there are now 1000s of TLDs. Thus, you can specify TLDs in the TLD blacklist section based on “badness” (as described above) or ones such as “ru” if you *never* plan to visit Russian sites. Long story short is you can’t add a full domain in the TLD blacklist. The TLD whitelist is only used in relation to the TLD blacklist. If you want to block all “com” sites, but you want to allow access to linuxincluded.com, you could specify the full domain in the TLD whitelist section. Hopefully that makes sense! If you want to block a few custom domains, I would instead add a separate “feed” under the DNSBL Feeds. Add a name/description, leave the source area blank, switch action to “unbound” and then add your desired blocks into the DNSBL custom_list at the bottom. Keep in mind that you will only block subdomains if you specify them literally or if you have the TLD option selected, i.e. a linuxincluded.com entry would not block mail.linuxincluded.com. Holler if you have any other questions! Great article. I’m returning to pfBlockerNG to see if the bug I experienced last November is fixed. When I ran the plugin my pfsense ( on Netgate 3100 ) would crash every other day. So uninstalled pfBlockerNG and switched to pi-hole. You mention the new version of pfBlockerNG in another article, I’ll probably try upgading to that next weekend since I do all Home Network projects then. Fingers cross that my pfsense server doesn’t crash. if it does , I can turn up pi-hole in about 5 minutes. Thanks! I’m a huge fan of pi-hole as well and I use it in environments where I don’t have a pfSense available. I have both new and old versions of pfBlockerNG running on 3100s without issue so I’m guessing it was something else. Did you ever test the flash to see if it was having issues? I think I remembered seeing something about flash used in some of the pfSense on Reddit a while back. That would make sense because I know logging and drive usage is turned way down (or off) on flash-based installs and pfBlockerNG does more reading/writing. Either way, let me know how it goes! I only loaded 4 blocklists that matched what pi-hole used, I set the list refresh rate to daily to lower the processing load, and then monitored DNS responsiveness and pfsense performance for a week. pfblockerNG didn’t crash the pfsense interface as it had before before, but often when I tried to load Web pages it would sit there for several minutes before the browser timed out. At the same time, the System activity monitor showed that pfBlockerNG was 100% CPU, and the pfsense dashboard would not finish loading. It turned it back off and switched back to pi-hole last night, and so far the problem has not re-occured. The problem is either not enough oomph in the 3100 or pfBlockerNG is buggy and always hogs the CPU. I don’t know which but I might load pfsense with pfblockerng in a Virtual Machine and see if it grabs 100% CPU again. I haven’t heard about the flash issue and I don’t know how to test it. As I mentioned before, I have several 3100s in the field with several blocklists with some on new version and some on the old version so I don’t think oomph is an issue. That said, I definitely load fewer lists on that hardware because it is on the light side. I reached out to the author of pfBlockerNG to see if he had any suggestions. Here were a couple of other items he suggested beyond simply looking at pfblockerng.log to see how unbound is configured. Let me know how the virtual machine goes! 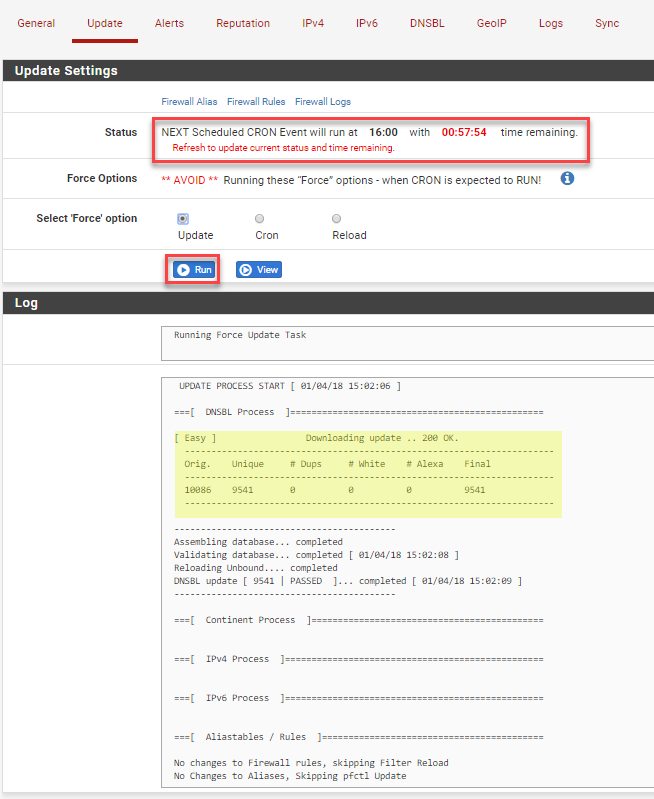 Setting Unbound DHCP Registration and Static DHCP can cause issues since any WAN/DHCP changes will reload Unbound and cause delays since the DNSBL db will get reloaded each time that happens. Thanks for pointing out that URL change. I’ve updated it in the documentation. Just a heads up that I received word the pfSense devs have stopped updates on 2.3.X packages, i.e. you will probably need to update at some point. You can also use VPNs like [insert VPN name here] for adblocking. I also enable the adblocker whenever I go for browsing on my PC. It works fine! Thanks for the input Baron! Good point! Numerous VPN providers can ad block and there are also several ways to do it locally. DNS blackholing using pfBlockerNG/DNSBL/pfBlockerNG just happen to be one of my favorites and it doesn’t require installing anything to a device. Just wanted to say great guide, but i am having a heck of a time getting pfblocker to block anything at all. If i try to ping a blocked domain, i get the response from 10.10.10.1, but web sites are still rife with ads. This is on a literally completely fresh install of pfsense, and following this guide to the letter. What could i possibly be missing? Thanks for the feedback Keller! Have you tried additional ad feeds? I use numerous feeds with very few issues. Also, do you know where those ads are originating from? For example, depending on the site, some ads originate from the domain so those will not be blocked. I personally use pfBlockerNG in conjunction with uBlock Origin and the two do a pretty great job together. The only other possible issue I can think of is if some of those were in your local DNS or browser-based cache. I’ll love to hear what you figure out so I can relay it to other readers if necessary.